Betty, as she is called, was an active member of the Unitarian Church of Calgary and became a member of the Comox Valley Unitarian Fellowship upon retirement. She served on the Board of each of those societies as well as several committees. During her period in Calgary, she was a participant and leader in the Prairie Woman’s Gathering. She was also a trained facilitator for the two UUWF programs: Cakes for the Queen of Heaven and Rise Up and Call Her Name. 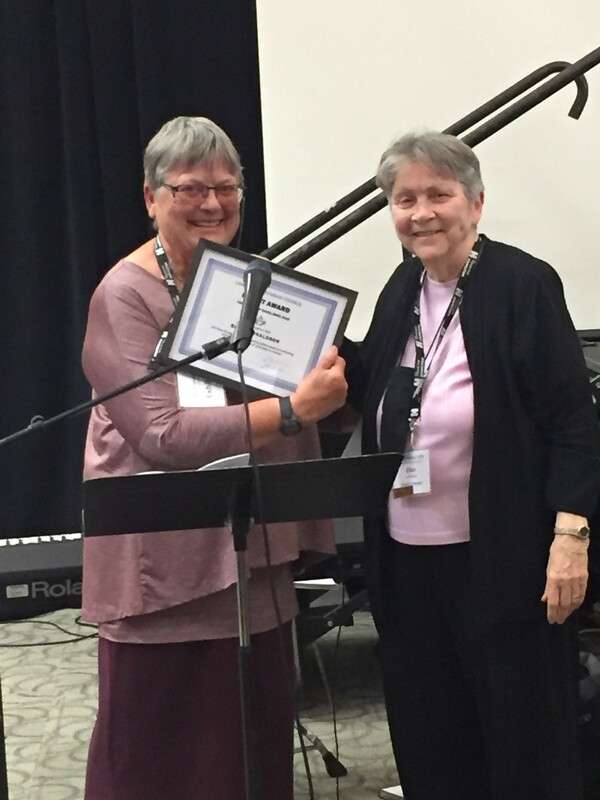 Betty was the last Canadian representative on the Board of the UUWA and when it changed its focus, she urged the CUC to develop a women’s organization to provide continuing education and programs for women in Canada and to support women’s equity issues. Ultimately, working with women living in Alberta, Saskatchewan and Manitoba who had established the Prairie Women’s Gathering, as well as women leaders in Ontario, B.C. and Nova Scotia and other regions, the Canadian Unitarian Universalist Women’s Association (CUUWA) was organized. Betty was the founding president, served seven years on that Board, and continues as an active member. In addition, for more than a decade, Betty served as chair of the CUC Choices in Dying Monitoring Group, and conducted workshops, “What is a Good Death”. After her retirement to Courtenay, this work allowed the CUC to be one of only three groups permitted to make representation to the BC Supreme Court regarding freedom of choice in dying. She continues to be active in the MAID issue and in the Green Burial movement. The CUUWA (Canadian Unitarian Universalist Women’s Association) invites all congregations across Canada to celebrate International Women’s Day in a service on one of the Sundays close to March 8, International Women’s Day. We would love to hear if/how you have used any of these materials, what your congregation did to recognize IWD, photos from your activities, and service ideas focused on women and/or feminism. Please send them to eldergomes@yahoo.com, and let us know if you give us permission to use them on our website and/or Facebook page. with help from Anneke Elder-Gomes and Caroline Jondahl, CUUWA Council members, and many others. Thank you!